Bosco Steels basketball team are one hand away from snatching the Dups Elite Men League. This comes after they beat the defending champions, Jazz 61-60 on Saturday during the first match played at Mavuso Sports Centre. The second set of the play-offs will be held on Saturday at Mavuso Sports Centre. A win for Bosco Steels will see them crowned champions while losing on Saturday will mean the two will also meet in the third set. Jazz have to win the match if they are still to stand a chance of defending the trophy they won last year. In the National Womens League, Super Ladies beat Lady Jazz 69-59 to put themselves in an advantage of winning the league. The will have to beat Lady Jazz in the second set slated for Saturday if they are to be crowned champions. 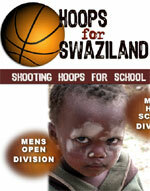 Swaziland National Basketball Association (SNBA) Secretary Bongani Shiba confirmed the games yesterday. He said the crowning of the champions in both leagues will be determined by the results on Saturday during the second set of the play-offs. We invite people to come in numbers on Saturday for the games. If the duo of Super Ladies and Bosco Steels win their games, they will both be crowned the champions, he said. Meanwhile, the games were delayed on Saturday for more than six hours as the venue was used for hosting the Oyama Swaziland Championships. The first game was slated to start at 1pm but it started at 8pm.